Those of you who faithfully follow my blog may know that my girlfriends and I love to get together for monthly dinner parties. Well, it had been quite some time since we last got together - a baby, an engagement, wedding to plan and big move, to name a few - have certainly kept us busy! Jourdan remedied this by having us over last Saturday, and we were able to catch up, enjoy her fabulous cooking and play with sweet baby Reese! Jourdan made two pizzas, and both were to die for. 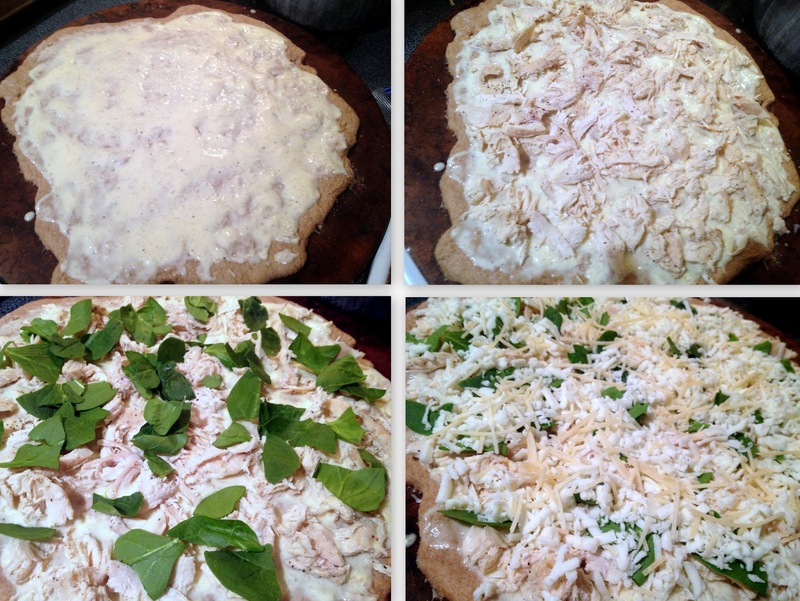 I could not stop thinking about the chicken Alfredo pizza she made, and I vowed to recreate it at home. Enter this delicious dish and perfect weekend meal. A huge thanks to Jourdan for the inspiration (and perfect girls night!). Note: I highly recommend investing in a pizza stone and preheating it in the oven! John never used one until we got married and he cannot stop raving about what a difference it makes! Chicken: Preheat oven to 375. Place chicken on a pan. Brush chicken with olive oil and sprinkle with salt and pepper. Roast in the oven for 20-30 minutes, depending on size of chicken breast(s). Remove from oven and shred with forks. Alfredo Sauce: In a saucepan or skillet, warm butter and cream over medium heat. Season with salt and freshly ground black pepper. Once warmed, add 1 cup shredded Parmesan cheese, whisking until combined. Remove from heat. *Preheat oven according to your dough. Then, assemble the pizza! 1. Roll out dough on a floured, flat surface. (Transfer to pizza stone, if applicable). 2. Spread about 1/2 cup Alfredo sauce on dough. 3. Sprinkle roast chicken evenly across pizza. 4. Add spinach to pizza. 5. Top with mozzarella cheese (and remaining 1/4 cup Parmesan, if desired). *Bake according to your dough's directions - our pizza took about 15 minutes. Let sit for 2 minutes before slicing. Then serve and enjoy! Optional: drizzle a little extra alfredo sauce on top of the pizza before serving. This was John's addition and it was delicious! Steps 2 to 4, for assembling the pizza. Fresh out of the oven and smelling delicious!